As the nights draw in, there’s nothing quite like a great fishing book or magazine to keep the fire burning. Contrary to the fears of book fans, real print is still fighting to keeps its place in the digital world we live in, too. In fact, you might even say there is a mini revival going on in the fishing scene, with not one but two new quarterly fishing titles launching, along with some excellent current books. So where do we begin? Well, I’m going to start with books, including one of the most unexpected treats I’ve seen in a quite a while, before we look at two current quarterly magazine offerings. Should you want to treat yourself, all the titles are linked to where you can order each item too (and you definitely do want to support angling writing, correct?). Every so often, a book is released that makes you stop and ponder “where the heck did that come from?” The Song of the Solitary Bass Fisher is just that book, coming straight out of leftfield. Or Cornwall, to be more accurate. The story of one man’s obsession with bass, it’s rammed with personal anecdotes, stimulating ideas and a whole creel full of great one-liners. In fact, it’s the most quotable fishing book I’ve read for a long time. Some books fit into the “how to” class, I guess. Other books are all about the stories and have a more literary, entertaining quality. The classic Hooked on Bass is a classic example of the first category- it’s full of great insight and evidence. However, much of it reads as if it was written by a high school science teacher (well, this is at least half true and no slight on an excellent guide to bass fishing). Cornishman James “Leakyboots” Batty’s book is a different kettle of bass altogether, though. Combining smart and original watercraft along with bonkers humour and laugh out loud quotes shouldn’t quite work, but it does. Here is that rare angler who can combine great knowledge with high entertainment value and pleasantly off-kilter jokes. Whether it’s comparing lure retrieves to musical styles and artists (bass prefer the tempo of The Buzzcocks to Desmond Dekker, apparently), conversations with sweary, pastie-chewing locals, or poking fun at posh modern tackle, the blend of offbeat humour and experience-based knowhow is compelling. Here’s a neat offering from writer, scientist and keen angler Dr Mark Everard, who many of you will know from his various articles and books. This one is not an out and out fishing book, but a glance at living things through the various seasons. Everything from cycles of life and death, to folklore and quirky bits of natural history, in fact. Getting the balance right for the layman is always tricky in such a volume, but I found this a great “dipping” book with nice short chapters and lots to discover. I must confess, I’m an angler who loves wildlife but quite often my understanding is embarrassingly limited. I can’t tell you what the heck the point of wasps is, for example, or explain why some years see more juvenile fish survive than others… well, at least until I read this book! There’s certainly good value in a blow by blow seasonal guide here, giving you things to look for but not swamping you with excessive detail. I started reading this book in September, and hence read the chapters about this month first, rather than in an A to Z fashion. I think this is the right idea- and the seasonal themes, along with the smart, detailed commentaries from Mark, help keep the book accessible but by no means dumbed down. There’s lots enjoy here, then, which you can then perhaps share with your fishing mates and pretend you knew it all along! In short, it’s a lovely book for dipping into at any time of year, whether you want to know more about kingfishers, bats, riverside fauna or the real story behind the closed season. Actually, let’s not go there. It’s as divisive as otters and Brexit, isn’t it? For those of you who already know a bit about Jack Perks, you are probably most familiar with his excellent footage of freshwater fish and other aquatic wildife. Indeed, you may have seen his work on BBC series such as Spring Watch. 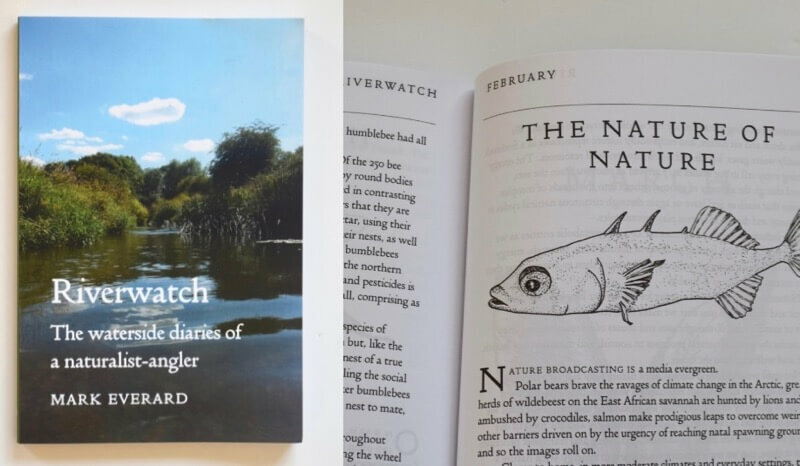 This, his second book, is not a book solely about fish in the mold of his debut Freshwater Fishes of Great Britain, but a beautifully illustrated guide to the life in our waters. Within its pages there are over 200 species of plants and animals. Rather than go for the complete smorgasbord of life (well, to be fair the whole shooting match would be an extremely long and possibly dull book! ), Perks has picked out a selection of the most interesting and widespread living things, including some you didn’t think lived in the UK at all! There are clear, concise facts about every species on show here, then, but as you’d expect, it is with the visuals that book really sings. From amphibians to waterbirds, glorious dragon and damsel flies, not to mention the fish, the photography is absolutely top draw. If you’re anything like me, you’ll pull faces at the crayfish and gasp at the birds in flight, along with the amazing pictures of aquatic creatures taken in their own element. It’s inspiring stuff and another book destined for my rucksack, to be dug out at regular intervals when walking or fishing (probably just as well it comes with a waterproof jacket). Now, we move onto the quarterlies- and with not one but two new titles up and running this autumn, it is great to see that there’s a future in this format. One thing I hear a lot from regular magazine readers is that they dislike repeated content and loads of copies lying about. In which case, the quartely is a sensible angle to take: indeed, why not swap quantity for quality? The obvious barrier is that bringing out a magazine with the production values of a book can put punters off. “What?” they cry “seven quid for a magazine? I can read stuff on the internet for free.” True, you can. But an alarmingly high proportion of it is either crap or basically just advertising. Whatever happened to beautifully produced articles and the smell and feel of real print? Here’s your answer. Today’s Flyfisher is lavish and produced with love, from the fine paper quality and coffee table proportions to the beautiful photography. 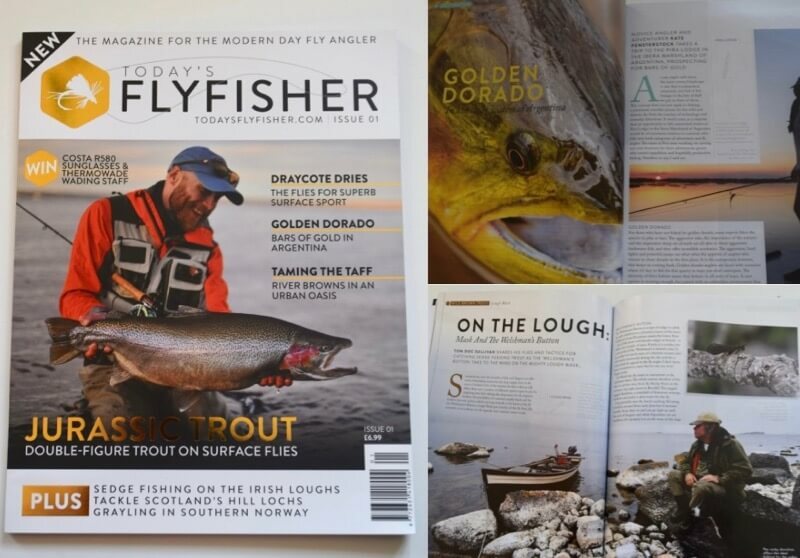 To me, it feels like the best and brightest bits of Total Flyfisher (not too surprising with former editor Andy Taylor at the helm), combined with an even broader spread of topics for articles and bolder, brighter production values. The magazine still has a practical appeal, then, with fly patterns and knowhow throughout, whether it’s Ceri Thomas on the River Taff, or tactical briefings from the likes of Kieran Jenkins and Simon Kidd. Where it goes above and beyond, though, are on the more descriptive and far reaching travel articles. There’s a cracking opener on Golden Dorado from Kate Fenterstock, while we’re also taken to Argentina for an awe-inspiring adventure in search of giant wild rainbows in a similarly well written piece. Real box office stuff. If that’s not quite your bag, though, or you don’t have the hard currency for the far flung stuff, there are also great articles on fly fishing for Irish trout and Norwegian grayling for the wandering angler. For me then, it’s the travel writing that really raises the bar in the new magazine and it’ll be interesting to see where this goes next. For a first issue, though, the balance of content is spot on. In fact, there can’t be many fly fishers who won’t find something to tempt them in these pages, whether your idea of heaven is hill lochs or English reservoirs. More of the same next issue please, TFF! 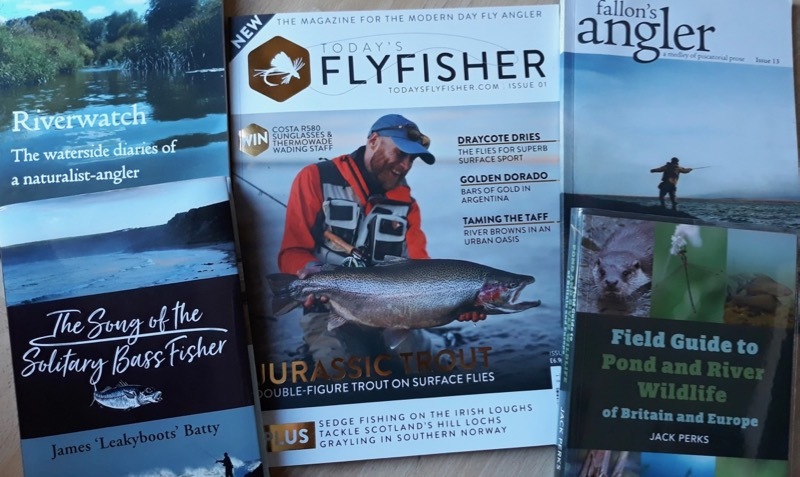 Of course, Fallon’s Angler is no new venture but a favourite fixture with those who love a longer fishing read and out and out story articles. Over four years since launch, it’s great to see the title going strong, with new names cropping up among the roster of talent already there. This issue doesn’t disappoint in terms of variety or quality. There’s summer fishing from a punt, not to mention Chris Yates’s latest account of carp fishing with Martin Bowler, the way nature intended. Not that the book-a-zine is all about nostalgia, or wicker basket stuff. There’s a nice piece about the logical and not so logical emotional trappings of the tackle we own from Wayne Thomas, while the most surprising piece of the issue for me is Dexter Petley’s The Man Who Planted Trout, a fascinating if ultimately tragic picture of countryman and writer Douglas Cavey. Add a dash of murder from Kevin Parr, along with some perfect nonsense from “the General” fishing the Mariana Trench, and you have plenty to keep you out of mischief on an autumn evening. That’s about all for my current roundup. Remember you can catch me every week in the Angling Times for a catch up, as well as the Turrall Flies blog (recently reporting from Cornwall and some grayling fishing). Whatever your tastes in fishing are, why not treat yourself to some great reading this autumn? The only way to guarantee more great work is to give angling writing your support.